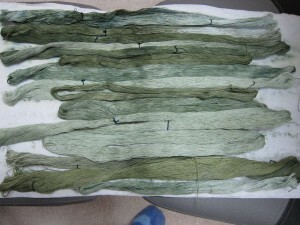 Today I worked on research papers and during my breaks I wound 50 yard skeins for the next time I try dyeing thread. It won’t be anytime soon, but I wanted to get started on the winding since that’s not too much fun. Also, it was the perfect break for the research paper. Tatting related, but not actually enough fun to get me so enthralled and distracted from the paper. I got through 3 balls so that’s a good start. I’ll probably keep going and wind through all the rest of them, but it’ll take me a while, and I don’t actually know when I’ll get around to dyeing them, but at least they’ll be ready to go. A little while back reread my post about trying to dye thread with the pomegranates and it got me into the mood to try dyeing again so I finally pulled out the yellow and blue dyes and made my second batch of dyed thread, this time in green and yellow. Mostly green and mostly size 20. I did a few variegated skeins, but since I don’t use variegated thread much I mostly made solids. For the most part I was just messing around and wasn’t really trying for anything in particular. Not trying for anything in particular means that I’m pretty happy with the way it turned out. I’ll probably keep messing around with dying thread in the future though I think I’ll probably want to switch to a different dye. 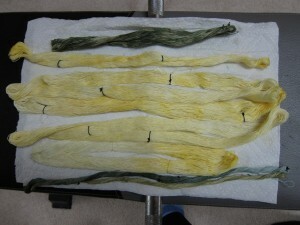 This is a powder dye I got to try out but I think a liquid one would be easier to play around with and mix, though I especially like the way the yellows look. One of the things I didn’t seem to do well was rinse out the greens. I thought I’d gotten all the extra dye out, but as I let them dry I saw that some of the green was bleeding on to the paper towels. So rinsed all the green again and let them soak a bit more and that seemed to take care of it without changing the colors at all. With the blues and yellows I just held them under running water and the seemed to rinse just fine, but maybe I had more dye in the greens. Playing around with dyeing has certainly given me more appreciation for the HDT that others make. I can’t imagine getting to the point where I can consistently get the same color scheme from skein to skein, let alone dye batch to dye batch. Krystle Dawne has some gorgeous ones she just finished and posted on her blog about. I don’t usually even care for variegated threads and I’m drooling. 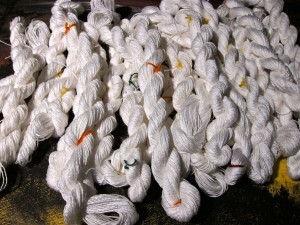 Playing around with the dyeing has been partly to use up a bunch of balls of DMC size 20 white. I’ve had them for a long time and never really been happy with them because they’re really more of a slightly off-white. If I want to tat with white, I generally want a bright white, so I figured dyeing them would be a good way to turn them into something I’d actually use. I’ve still got another 10 or so balls left so there’s still lots of playing with dye in my future. Unfortunately that means there’s lots of winding of skeins for dyeing first in my more near future. Ahh well. All part of the process. Get More (Tatters on) Craftsy! I love how when someone starts following you on Craftsy they send you an email telling you that the person has been inspired by you. It’s cute and gives me a warm fuzzy feeling. I’ve had barely any time to explore Craftsy, but I’m pretty excited about the possibilities for tatters. It’s still relatively new and so I feel like if we can get a lot of tatters to join we can get a bit of attention for tatting. I’m on Ralvery because I’d like to learn to knit and I used to crochet, but they are pretty adamant about being ONLY for knitting and crocheting and making it very clear they have no plans to expand to other fiber crafts. Craftsy looks like it could be the substitute. Right now tatting is still only in the “other” category, but if we all join up maybe we can get them to give it it’s own category. I’m also very excited about being able to sell patterns there with an automatic download for the buyer so they don’t have to wait for me to send them an email. I had someone buy my pattern book yesterday and it threw me off to only get an email about payment and not one about fulfillment of the order. I like it though. This is the last week of my masters degree so I’m basically living in a world of research papers about GAAP, IFRS other exciting accounting regulations. I probably won’t be able to do a lot of tatting this week, but I have a bunch of things I haven’t gotten around to posting from the last couple weeks, so I plan to post about those. After spending time at the yarn shop this weekend I started experimenting with tatting with yarn. This is the start of a scarf using an insertion pattern from (where else?) one of the Priscilla Tatting books. To understand the scale, the book it’s on is the back back cover of my bound print out of Priscilla Tatting book #2. This is the first of 6 rows. Originally I’d thought that I’d be making a belt out of pattern, but once I got started it became clear that it would end up being too thick. So a scarf it is. The yarn is a Debbie Bliss yarn and it’s a worsted weight cotton. Finally my large Tatsy shuttles are getting some use! The pattern thus far is pretty basic. Both rings and chains are 2(-2)x5 or 5 picots separated by 2 ds. The next row will be the same, but the rings will interlock at the 2nd and 4th picots. These first two rows are going to be in white. 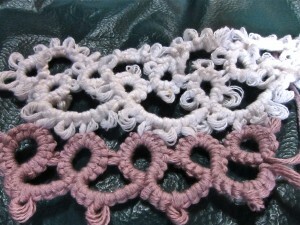 The next row on either side will be light purple and then the outer rows will be purple. I think this will be my main project for the drive up to Seattle. Hopefully, I’ll have it done by the time I arrive in Washington from sunny California. Gloves Are Off to the UK! It’s always fun to be mailing things internationally. Well, except for the actual trip to the post office, but I do really like the international-ness of Etsy. I got one of our KJazz volunteers to pose for this picture before I packed them up. Again, you can’t see the difference in the colors of the rings and chains. It’s subtle, but the clusters are a bit darker. They’re in ecru and the chains are in cream. I like the color combination even better than I expected. 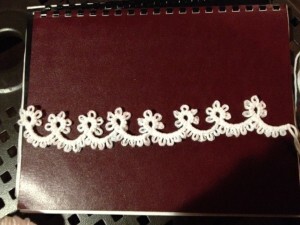 Now that the pledge drive and the gloves are done I’m getting back to other tatting projects. 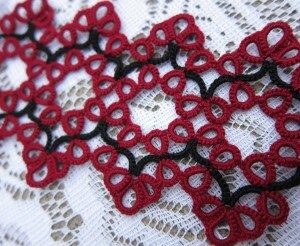 I’m meeting up with a bride this weekend and am working on her garter belt as well as some of the favors for the guests. Speaking of international, I have been talking to someone else in another country about doing some combined work. I won’t go into details here until we’ve settled on the project and scope some more. It should be very interesting when it’s done!